Unique and recognizable landmarks are a staple of marketing in Spokane. Take for example Steam Plant Square or the Garland Milk Bottle. These recognizable landmarks draw customers and sight seers alike. Take advantage of unique location features you may already own or lease. 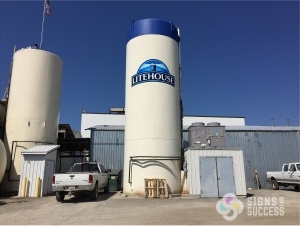 Litehouse Foods recently added giant storage tank graphics to their new factory location. A vinyl wrap or a logo decal makes good use of unbranded space. You can even create a giant billboard across buildings or other features. We stock a variety of vinyl films to adhere to virtually any surface, including rough or porous surfaces, and yes, even a giant storage tank. Litehouse opted for a large logo decal to brand the storage tank on their property—simple and recognizable graphics that they use across all their branding. Vinyl decals are non-permanent and remove easily when it’s time to change graphics or locations. What once was an odd feature or even an eyesore can become great advertising. In addition, getting seen from the highway or major streets makes finding your new location easier. Vinyl wraps offer a smooth painted-on look for eye-catching advertising anywhere! Turn your blank space into valuable advertising space with custom graphics. Signs for Success is a locally owned family business in Spokane, and we strive for excellent customer service, perfect color, and quick turnaround on every project. Our large production facility allows us to design, print and install everything in-house. Contact us for a free quote on a custom storage tank graphics or other vinyl wraps today!